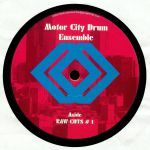 Review: ** MCDE REPRESS ** Dani Plessow dons the Motor City Drum Ensemble name with Say A Prayer signaling a return to the production game following his much publicized creative burnout. It's clear that Plessow's period of convalescence has worked wonders, with the four tracks here every bit as deep and dusty as the much vaunted Raw Cuts series upon which the MCDE project was launched skywards. Proceedings open with the two part suite of the title track, laying down fuzzy chords and intermittent vocal swoons over a gritty 909 backbone on the opening track; part 2 meanwhile will have you digging out those Raw Cuts 12"s in order to do a MCDE master mix, such is it's immediate warmth and neck snapping drums. On the flip, Plessow uses "The Stranger" as a chance to traverse bleepier, rattling techno terrain with superb results, whilst "SP11" is rasping high octane house at it's finest. Review: Given the "contemporary classic" status of Danilo Plessow's Raw Cuts series - arguably a string of 12" singles that helped redefine deep house for a new generation - the announcement of a surprise remix 12" is enough to make even the most level-headed DJs go weak at the knees. 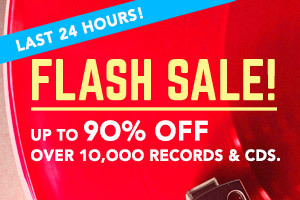 Pleasingly, said remixers more than live up to the hype. 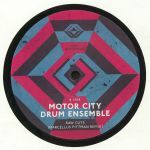 Marcellus Pittman's version - smooth and deep, but with enough raw disco cut-ups and wonky Detroit swing to impress those who like it raw - is particularly good, though Mike Huckaby's locked-in deep house groover is not far behind. 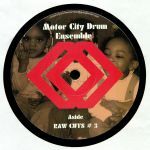 There's also a superb version from Recloose, whose crackly, shuffling beats, sweeping pads and soulful vocal samples recall his earliest productions for Planet E.
Motor City Drum Ensemble - "Monorail"
Hundred 20 - "Upper Alley"
Hundred 20 - "Summer Of 89"
Creative Swing Alliance - "Now (Loving You)"